Originating in the warm climates of Africa and Asia, the sesame plant has now been naturalized all over the globe. Learn how to cultivate this tasty and medicinally-useful herb. 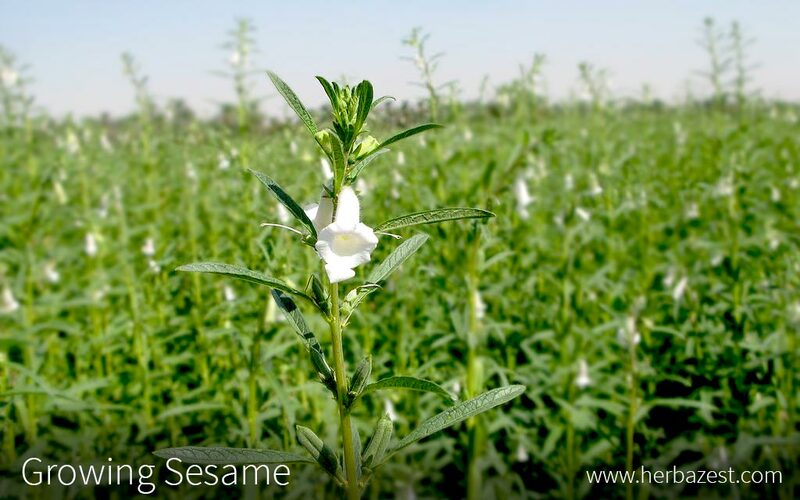 Sesame is a highly adaptable plant and it is possible to cultivate it in most regions, as long as it is subjected to its preferred conditions related to soil, irrigation, and general maintenance. The following growing guidelines will help you to cultivate and enjoy this useful herb in your own garden. The first thing to consider when deciding on the appropriate patch of soil is that sesame plants require a position in full sun. Once a suitable patch of soil has been established, a layer of organic mulch should be applied in order to help the soil retain moisture, as well as to provide additional nutrients. The soil should be generously watered at this stage, a few hours before sowing the seeds. Seeds should be planted around half an inch (1.25 cm) below the surface of the soil and six inches (15 cm) apart. Because of their potential height and spread, it is not necessary to plant many to achieve a high yield of seeds. It is important to plant seeds after the risk of frost has passed, as frost will inhibit any development or cause death in both seedlings and well-established plants. Germination rates of seeds are at their best when subjected to temperatures of around 70°F (21°C), and they are unlikely to develop at all in temperatures below 50°F (10°C). Seedlings that have been cultivated indoors should be transplanted to an outside position around two weeks after emerging, when daytime temperatures are at least 70°F (21°C). In cooler environments, it is possible to successfully cultivate sesame plants inside. To encourage germination, seeds should be planted in a container that can be encased in a clear plastic bag or covered with a clear lid. When the seedlings have emerged, they can either be transplanted outside or grown fully inside. Inside, the container should be uncovered and then placed in a sunroom or similar location, where they have access to sunlight and a warm air temperature. It may be necessary to artificially supply heat by placing plants near a radiator or by using a heat lamp. Sesame plants require constant moisture in order to thrive. Water should be applied to the soil before the seeds are sown, and then once or twice a week after that throughout the whole growing process. The amount of water necessary will differ depending on the climate, so a touch-test will need to be carried out. At least the top inch (2.5 cm) of soil should be consistently moist. Water should be applied at soil level rather than overhead in order to somewhat decrease the likelihood of diseases, many of which are caused by excess water, resulting in damp foliage. In addition to a layer of organic mulch, it is sometimes advised to apply a balanced fertilizer when cultivating sesame plants in order to stimulate growth. Depending on the specific composition of the soil, other fertilizers may be required in order to achieve the optimum yield for harvesting. A soil test will be necessary in order to determine if it is lacking in anything, but it is most often nitrogen-, phosphorus, and potash-based fertilizers that are needed. It is not usually necessary to prune sesame plants; however, if they look to be struggling, doing so may help to encourage regrowth or general improved condition. Any damaged components should also be removed in order to inhibit the spread of diseases or pests that may have caused this. Sesame is an annual plant, which means it will only develop once - it will die at the end of the season. For this reason, cutting the plant back after harvesting is futile. Sesame plants are sensitive to many commercial herbicides, so in the event of weeds, hand removal is often recommended. Alternatively, it is necessary to research which products may be used without damaging sesame. It is advised to avoid growing sesame in the same vicinity as johnsongrass, cucumber, sunflower, and goldenberry because of the invasive nature of these plants. Sesame plants can be affected by various pests, the presence of which may diminish the health and development of the plant. Some of the more common insects are thrips, grasshoppers, cutworms, whiteflies, and the green peach aphid. An abundance of any of these is likely to lead to stunted development of the seed capsules. It is possible to use a pesticide to treat infestations, but these products may harm young plants. It is therefore recommended to hand remove pests from seedlings. Diseases known to commonly appear on sesame plants include bacterial leaf spot, root rot, and Fusarium wilt. All of these can be caused by consistently damp foliage, which is why it is advised to apply irrigation at soil level. If signs of disease become apparent, it is important to remove affected components of the plant in order to decrease the chances of the infection spreading. Although it is largely the seeds that are consumed by humans, many animals will also eat the other components of the plant. In fact, in some countries the stalks and leaves are used in cattle feed. Wildlife known to feed on sesame plants include birds, squirrels, and rodents. Many cultivars of sesame are "shattering" types, and so it is important to harvest the seedpods before the end of the growing season - when the seeds will be scattered to the ground, where they are likely to be scavenged by wildlife. Sesame plants are usually ready to be harvested after around three months. At this point, they should have reached a height of approximately three feet (90 cm), and the stem should have become yellow to almost brown. Leaves may begin to fall, but the seedpods should be green and intact rather than brown and drying. The stem should be cut below where the pods begin, and then left to dry. When they are sufficiently dry, pods can be individually removed and split open to reveal sesame seeds. Once the seeds have been removed from the pods, it is important to make sure there is no moisture whatsoever before storing them. It is advisable to separate them and allow them to dry thoroughly for at least one hour. After this, they should be put into an airtight container, preferably in the refrigerator or alternatively in a cool, dry place. The shelf life will be between three and six months, depending on storage conditions. Sesame plants are fairly simple to cultivate, and can be a pleasant addition to the garden - not only due to the culinary and medicinal benefits of their seeds, but also because of their pretty appearance when flowering. Some understanding of how to grow and take care of this plant can help any gardener procure a generous yield. Plants For A Future, Sesamum indicum L.